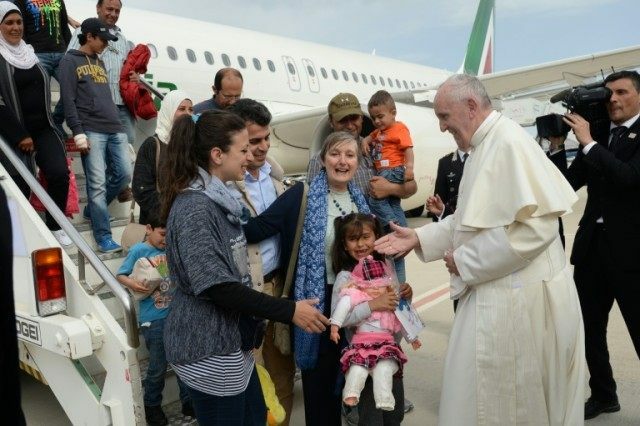 Rome (AFP) – Syrian refugees taken in by Pope Francis following his visit to the Greek island of Lesbos hailed the pontiff as a “saviour” for offering them a new life. In a hugely symbolic move seen as a lesson in solidarity for Europe, Francis, who is himself the son of Italian migrants in Argentina, on Saturday took 12 Syrians from three families — all Muslims — home with him from Lesbos to the Vatican. “All refugees are children of God,” the 79-year-old pope said on the flight back to Rome referring to their religion, adding that though his gesture was “a drop in the ocean” he hoped “the ocean will never be the same again”. In an interview published Sunday with the Italian daily La Stampa, the families, who spent their first night in Rome at a Catholic charity, expressed their gratitude. “We saw friends and relatives die in the rubble, we fled Syria because we no longer had any hope,” said Hasan, an engineer from Damascus, who arrived with his wife Nour and two-year-old son. After fleeing to Turkey, Hasan and his family joined the migrant trail to Europe, piling into a rubber dinghy that set out from the Turkish coast for Greece. “But it was overloaded,” said Hasan, recalling the pitch black of the sea at night and the waves rocking the vessel. “In Lesbos, we understood that we were stuck in a place that we could not leave, (we were) in a trap, a prison,” he said. He described the pope as “our saviour” for whisking them off the island, where thousands of migrants risk being sent back to Turkey under a new EU-Turkey deportation deal. Wafa, who was also on the papal flight from Lesbos with her husband Osama, eight-year-old daughter Masa and six-year-old son Omar, together with her husband, described the “constant bombardments” in recent months around their home. Wafa said she and her husband, who are from the Damascus suburb of Zamalka, had opted to cut ties with the past. “But we know we took the right decision,” she said. After their stay on Lesbos, which seemed interminable, “Francis gave us a new life,” she said. Ramy, a 51-year-old teacher from the eastern Islamic State-occupied city of Deir Ezzor, fled Syria with his wife Suhila and three children — sons Rashid, 18 and Abdelmajid, 16, and seven-year-old daughter Al Quds — after their home was destroyed in the war. “We discuss a lot and find it hard to imagine what life will be like in the future: we don’t know whether we will start over in Europe or whether, one day, we will be able to return to a Syria free of war and violence,” he told La Stampa. “We are grateful to the pope, we will prove ourselves worthy of this opportunity and the gift he gave us,” he said. Many of them are Syrians, fleeing the horrors of war. Arrivals in Greece have drastically fallen over the past weeks after Turkey agreed to take back all people who have been denied asylum in return for billions in EU cash and other concessions. Human rights groups have assailed the arrangement. In an emotional address to worshippers who gathered for his weekly Angelus prayers in St. Peter’s Square, Pope Francis recounted his visit to the migrant centre in Lesbos, accompanied by Ecumenical Patriarch Bartholomew and Archbishop Ieronymos of Athens. “I saw such suffering,” he said, visibly moved. But the woman fell victim to Islamist radicals, he said. “She had her throat slit by terrorists because she would not renounce Christ and abandon her faith,” said Francis, calling her a “martyr”.